Starting off on your career as a professional groomer? Well, you might need a long list of essential tools that help you groom all your clients! With so many products in the market, how do you choose the one that suits you best? Most beginners are often confused about which tools they need. Well, not to worry! We’ve compiled a list of the best and most essential dog grooming tools. These basic tools help you go through one furry client after another without any glitches! These products, when combined together, will make the most inclusive grooming kit for all dogs. When it comes to professional groomers, they need to have only the best tools in their armada! Not only that, they should have a wide variety of these tools. The main reason is that different breeds of dogs have different needs. For instance, an Alaskan malamute would need a different dryer and comb than a Poodle. So, as a professional, you should have all kinds of equipment to serve all your furry clients. Let’s take a look at the different types of grooming tools in the market. Combs and brushes are essential in keeping your dog’s coat shiny and smooth. There are a wide variety of combs and brushes available in the market that can help you achieve different purposes. Some will help you de-mat your dog’s fur while others remove dead fur. 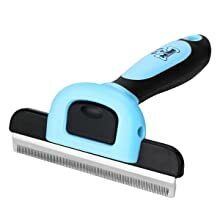 Slicker Brush: Best suited to remove small mats from dogs with thick undercoats or long hair. Dematting Comb: Perfect for detangling big knots and snarls. They have sharp metal teeth to help slice through the dog’s coat. Glove Brush: Gove with plastic nubs to brush and provide a gentle massage. Rake Comb: Cuts away or removes undercoat. Bristle Brush: Removes loose hair from short haired dogs. Also, they help to keep the coat shiny and soft by distributing the dog’s natural hair oil. Wire Pin Brush: Perfect for curly hair. Nail trimming requires a lot of skill and still, it might be quite difficult for the groomer. Dogs tend to be the most stressed during this stage. So, you have to be extra careful not to hurt the dog or break his nails in the process. Scissors: These are best for smaller dogs. However, ensure that the blades are razor sharp for a clean cut. Guillotine Clippers: These are like regular nail clippers and used for medium sized dogs. Plier Clippers: These are mostly useful for the larger dogs. Their blades are curved so as to better accept the dog’s nails. Nail Grinders: Nail grinders usually contain a sand grit which rotates. They are usually much safer and are perfect for all dogs. After you have bathed your pet, you need to dry him off. Otherwise, he might get a cold it might get the entire house wet. Plus, any dirt or dust can easily accumulate on wet fur. So, it is quite essential to dry the dog off right after a bath. 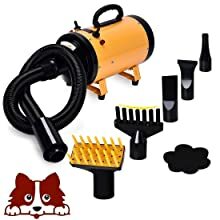 Most newbie pet owners wonder why they can’t just use regular hair dryers. The fact is that most dog dryers rely on high-speed air to dry the fur rather than heat. Heat can stress the dog out and he might end up running away. There are various nozzles that you can sue for different fur types. Hair trimmers or clippers are quite essential for grooming a dog as they help get rid of long hair and mats. These dog grooming clippers are designed to cut a dog’s hair as it tends to be much thicker. Most trimmers come with a comb attachment to easily go through long hair and a blade guard helps you chop the hair to the desired length. In addition, high-quality clippers are equipped with a number of blades and speed settings to help you clip different portions of a dog’s coat. 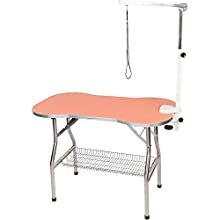 A grooming table helps make the grooming process much easier. For professionals who deal with multiple dogs in a day, this is a much-needed accessory. You can place your dog at the desired height while you work on him. Most tables come with restraints or loops that help secure the dog’s paws or body to allow for easier grooming. It is not a great accessory for you but also for the dog as it won’t move around which could have cause nips. If you’re looking for reliable clippers that last you through hundreds of furry cuts, then the Andis UltraEdge is perfect for you. The variable high and low speeds allow professionals to target all kinds of areas, from dense to light fur. Moreover, to help you keep your pets calm, the device is extremely quiet and vibration free. If that wasn’t enough then the cool running design eliminates the need of a fan and ensures that you can groom your pet for a long time before worrying about the device overheating. The detachable blades allow for easier cleaning and the 14 feet cord ensures better maneuverability. Apart from that, a locking switch on the device ensures that you never have to worry about the device shutting off. In addition, the round barrel and the ergonomic handle makes it easier to hold for hours on end so you can go about your business without any stress. The cord is a little thicker which makes it harder to bend. The Flying Pig Grooming Table is a heavy duty table that allows professionals to groom dogs in a safer and more secure way. The durable and sturdy stainless steel frame ensures that the table can hold up to 330 lbs without trouble. Also included are non-skid feet that ensure that the table does not slip or wobble while you groom. What’s more is the non-slip rubber surface that helps you secure the pet easily. Moreover, it is easy to clean so you can simply wipe away all dirt. The table also comes with a heavy-duty stainless steel grooming arm to help you keep your dog in an upright position during the entire process. Lastly, the table is foldable and adjustable. This means you can easily carry or store the table anywhere. Easy to carry and store due to foldable design. Anti-skid feet that do not wobble. Keeps your dog secure in an upright position. Doesn’t come with instructions so it is hard to set it up. No professional groomer’s kit would be complete without the Dremel Pet Nail Grooming Tool. The device allows you to safely, quickly and easily trim your dogs’ nails within minutes. The rotary tool is a safer and less stressful alternative to clippers. 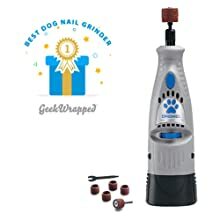 The clipper comes with two different speeds that allow you to safely trim toenails while the 60 grit sanding drum allows for a more humane experience for the dogs. The device is powered by a battery and thus includes no cords. This makes it easier to maneuver around your dogs. Moreover, the product is quite easy to assemble as all you have to do unscrew the top and insert the top. Then just tighten the top and you’re good to go! The battery can be charged within 3 hours, which, admittedly, is a long time but it will last for hours as well! Cordless operation makes it easy to maneuver. Cannot handle any drops so it is not very durable. The iSeaFly Dog Grooming kit is possibly the all-in-one solution you were searching for. The kit comes packed various instruments that a professional groomer needs. 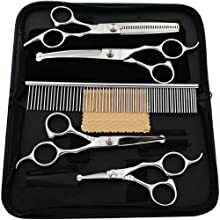 The kit includes a thinning shear, a curved scissor, two straight scissors, a pet comb, a cleaning cloth, and a black leather case. All in all, the tools can be sued to trim all parts of the dog’s body whether it has dense fur or not. The best part about the kit is that all the scissors are safe. They are equipped with a rounded tip so you can easily go about grooming your clients without worrying about hurting them. The razor sharp edges of the scissors ensure that you can cut through the densest coat like a hot knife through butter. Moreover, all shears are designed to ensure ergonomic comfort to reduce hand fatigue. What’s more is that the premium, heavy duty stainless steel design grants the kit its durability and sturdiness. Includes multiple tools for versatility. Safe rounded tip scissors and shears. Sharp edges for intricate cuts. Small finger holes make them unsuitable for those with larger fingers. Scissors are a little heavy. The Pet Neat Grooming brush is the ultimate de-shedding tool for dogs that every professional should have in their armada. It is perfect for removing mats or dead hair in a matter of minutes. The durable tool is designed to last you for a long time. In fact, the stainless steel blade included in the brush comes with a blade cover to protect the blade and also to keep you and pet safe. The easy to grip handle ensures excellent ergonomics so you can de-mat client after client without any signs of hand fatigue. It also allows for intricate and more detailed cuts. In addition to this, you can easily remove the stainless steel comb as it is detachable. All you have to do is press a single button at the top of the head and replace it or clean it. Also included is a lifetime warranty that allows you to replace the brush or even refund it without any hassles! Detachable and easy to clean comb. Includes a blade as well as a cover for safety. Perfectly removes tangles and dead fir. Easy to grip and ergonomic handle. The individual comb heads might not last long and need replacements soon. Can spook some pets out due to the large size. A savior for dogs in the winter time, the Free Paws Dog Hair Dryer ensures that your furry little clients stay dry after their fresh baths. This helps prevent any cold or other diseases. The Blower comes with a 3.2 HP Dryer as well as 4 different nozzles. The dryer features three heat settings including off, low or high heat. Generally, the temperature between these settings usually ranges from 96-158 deg F and can be easily adjusted. In addition, the dryer features two different airflow speeds, low at 4921 FPM and high at 9842 FPM. Also included is a flexible hose that can be adjusted according to length from 2.6 feet to 7.9 feet. The 2.5 feet power cord allows better maneuverability as well. To drive the bargain home, the manufacturer offers a lifetime limited warranty to help protect your investment. Includes variable heat and air flow settings. Includes 4 different nozzles to allow for versatility. Now you know what it takes or rather what tools it takes to become a professional groomer! A trimmer, nail grinder, dryer, grooming table, shearing kit, and a dematting brush can help you groom all kinds of dogs! 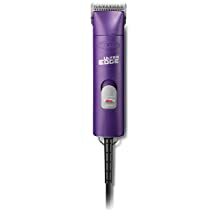 Although all the products are absolutely essential, if we had to choose the most essential one, we would choose the Andis UltraEdge AGC2 Detachable Blade Clipper. This is because it can remove mats and thus you might not need shears or a comb when you have a clipper. It is durable, quiet and easily maneuverable! So, are you ready to kickstart your grooming career?